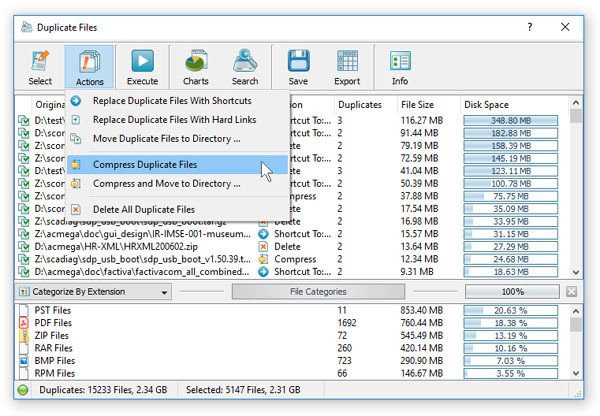 DupScout Server allows one to replace duplicate files with shortcuts or hard links, move duplicate files to another directory, compress and move duplicates or delete all duplicate files. In order to select a duplicate files removal action for all duplicate file sets, open the duplicate files search results dialog and press the 'Action' button. In order to select a different duplicate files removal action for one or more specific duplicate file sets, select the required duplicate file sets, press the right mouse button and select an appropriate duplicate files removal action. WARNING: The Windows system directory contains many duplicate files, which are critical for proper operation of the operating system and removal of any of these files may damage the operating system and make it completely unusable. 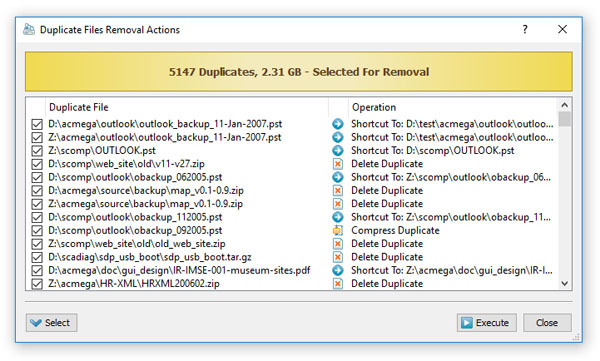 Once finished selecting duplicate files removal actions, press the 'Execute' button on the duplicate files search results dialog, review selected duplicate files removal actions, press the 'Execute' button to confirm the operation and wait for the duplicate files removal process to complete.